<br/> //Notice this has two break lines, i would like to stop after seeing two consecutive break lines. I am not entirely sure where to go from here, i would like to read all the text until i see two breaklines and stop ? 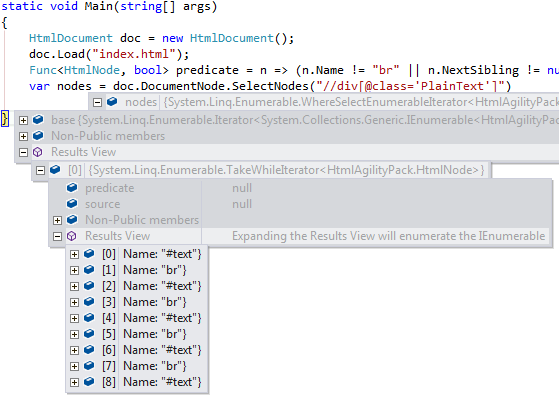 I looked at the childNodes nodes in Visual Studio runtime inspector and noticed there actually isn't two consectuive <br/> lines but a single break line and a #text tag with its innerHTMl being \n a new line character. <br   /> //Notice this has two break lines, i would like to stop after seeing two consecutive break lines. I removed empty #text values since when you have a newline between the last two br tags you actually get a #text tag with newlines. I think this is where the newline confusion lay.